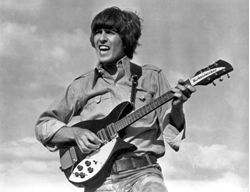 George Harrison feted on what would have been his 75th birthday . Beatles Radio: The Beatles, Solos, Covers, Birthdays, News The Fab 4 and More! Former Beatle George Harrison would have turned 75 on Sunday and fellow guitarist Little Steven Van Zandt, from the E Street Band, is setting his alarm to celebrate. Van Zandt, along with Bachman Turner Overdrive founder Randy Bachman and Ringo Starr’s musical director Mark Rivera, are meeting at E. 32nd St. venue The Cutting Room at 8 a.m. on Sunday for a visit with Ken Dashow, who hosts “Breakfast With The Beatles” on Q104.3. “They will be telling their favorite George stories and strapping on some guitars to jam to a few Beatles tunes,” according to an insider tied to the appearance. Van Zandt, a big Beatles fan, was joined on stage by Harrison’s old bandmate Paul McCartney during a November performance in London where the two of them performed a rousing rendition of “I Saw Her Standing There.” Video of that performance nearly broke the Internet. Harrison died in 2001 at 58 after a long battle with cancer.